Will our dream house ever become reality? I was going to drive a convertible as my everyday car. ...and it was going to be built by my dad. ...with a good book and the Florida sunshine being my only company. Some of these dreams came true, fortunately, either just as I had imagined them or in some distorted but perfectly acceptable form. Very few of these dreams are still dreams for me. But I do hold on to just one of my childhood dreams: to live in a house my dad built. I have watched him put his heart and soul—his passion—into dreaming, drawing and constructing homes that are nothing short of masterpieces, and I have always wanted one of my own. Because he lives and builds in Colorado now—and he's not likely to want to move to Indiana for a few months to build my house—I'll settle for having him design my—now, our—house. It's something I've been dreaming about for years, and for the last year (since last February, to be exact), it's something Chad and I have been dreaming about together. We bought a ton of house design books. We made lists of must-haves and wants and wouldn't-it-be-cool-to-haves. We have made countless comments to the effect of, "In our next house, we will definitely...." We—or rather, because of my obsessive and organization-freak personality, I—have worked the math over and over and over again, considering Chad's expected merit increases and an upcoming promotion, my workload expectations, debt pay-offs, various down payment possibilities, ever-changing interest rates, changes in expected square feet and all of those things along the way that we don't expect but are likely to encounter. We (window) shopped for lots on which we would build and picked out a couple we liked. We got disappointed when one of the lots sold. We started making some major financial adjustments, seriously focusing on paying off debts and saving cash for a down payment for the lot and for the house. I guess you could say we had things pretty well planned. And then yesterday, a dramatic change. It would be fair to say I broke down. Chad would back me up on that and probably add his own two cents. :o) I'm not ashamed to say that. It's a sad fact of life that being a working mom is rough. And it has been weighing on my heart a lot lately. Because I have obsessed over the math for the new house, I know we could get what we want in about a year, after we pay off our debts and have time to reach our goal for saving a down payment. (We don't want anything extravagant, but because we want to build a custom home, it is a little pricey and requires a fairly significant amount of cash-in-hand.) Our goal was to buy a lot this year and build at the beginning (maybe) of next. We could do it—if I wanted to commit to working a ton of hours every week for the foreseeable future in order to make it happen. This week, I was once again reminded that I do not, in fact, want to kill myself for my work—or for our dream house. I struggle with finding balance between work and home life. I will be the first to admit it. I don't question my decision to work, but I do question whether or not I am doing a good job at finding the right balance between work and family. It's something I have gone back and forth on since shortly after knowing I was pregnant with my first-born. I quit my then full-time job and found a part-time one in my field. I loved that job for many reasons but discovered there was more to my work than just a great schedule. I quit that job and went back to full-time for many reasons. That job was a good career change, but I was quickly reminded that the often-six-days-a-week job with a two-hours-a-day commute was no life for a mom. So I started freelancing. "Perfect!" I thought...until I started getting what I thought I wanted—lots of work—and discovered...again...that there is more to life than working. So that's where I am today, back to Square One. I'm back to the age-old question of what, exactly, is the perfect balance? There's no easy answer. I love my work and I love to work. I have worked hard to develop a business from scratch and, to put modesty aside for a minute, think I should pat myself on the back for that. I don't want to say no to anyone (and won't to established clients...so don't worry, guys!) who offers me work. I love what I do and love having a job that is creative and flexible. I like knowing I am contributing to my family's financial well-being and know that to live in the house we dream about, my contributions will be just as important as Chad's. BUT—and this is a BIG "but"—I want my sanity, too. I want more time to relax and enjoy my family. I want more time to be creative (for fun): to scrapbook, to journal my memories, to do digital scrapbook projects, to play with photography, to organize my massive photo archive, to get some of my favorite family photos on the walls of our home. I want more time to sleep. I want more time to keep up my house. I want more time to clean and de-clutter. I want more time to build some flexibility into my schedule so I don't panic when we have snow days (like tomorrow is likely to be). I want more time to have lunch at school with my first-grader once in a while and to pick up my preschooler early from school for visits to the park on nice days. I want to be more relaxed when it comes to my kids' behavior (a stressed mom is not a very patient one!). I want more time to go on dates with my husband. I want more time to just sit and talk with my husband...maybe even (gasp!) watch a movie with him. Yes, I know that the people in my life are far and away more important than the things in my life. I have known that forever, yet I seem to often need these little reminders that I need to get things in check once in a while. I get lost in my work too easily, perhaps. I need to take notice when I'm getting too involved in my work to live my life. Unfortunately, the reminders often come in the form of pent-up frustrations and stress bursting from my seams in the form of a good cry. I always feel better after a good cry, and honestly, it's a welcome release now and then. But it's a bad sign. It's a sign things are getting close to being out of control. My cry time yesterday was one of those reminders. I have been too busy lately. I know that. I have made my deadlines, but there have been times when it's been close and other times when I've had to sacrifice some serious family time to make it happen. That's no one's fault but my own. And I know there will always be those kinds of times. But I can't keep going at this speed. So I will regain control of my workload...even if it means we put building a new house on hold for a little while longer. My mind has been distracting me today. There are at least a hundred things on my mind. Thought I'd jot down a few, and then maybe I'll have a better chance at focusing on my work. The day care drama continues. My friend Michele sent me a note today about what she witnessed at the local park this morning. She was visiting with her kiddos, and G was there with his lovely day care. Let's just say there might as well have been no adult presence there. These kids are 6 years old. Get with it, people. I'll share her note with you all later. My gosh. We're looking forward to a fun evening with old friends tomorrow. Our friends Kevin and Kelly, and their three (and a half) cuties are coming into town for dinner and hanging out. We can't wait to see you and catch up, guys. Let's hope for some sunny weather! Deadlines, deadlines, deadlines. I have too much on my plate this week. But I'm squeaking by. Staying productive (although my mind's been wandering as I've tried to write an article for a local magazine today). As much as my family stresses me out (as everyone's family does, I think) sometimes, at least I have a family, and I didn't spend my childhood feeling like no one loved me or wanted me. That article I mentioned? The woman had NO family from age 7 to 21. Watched her parents have physical fights. Heard her mom ask her brother to load the shotgun so she could kill her father. Taken into custody of the court. Completely abandoned by her mother. Separated from her siblings. Father had no interest in taking her back. Became a child servant on a farm. (Interesting story. Find her book, I Was a Waif and Child Servant...No Regrets, by Joyce Robinson, online at www.authorhouse.com, or watch Mooresville Magazine for my story, out Sept. 1.) My life? Could have been much worse. Thanks, Mom and Dad (and everyone connected to them - steps, sibs, etc. ), for wanting me (although I'm sure you questioned yourselves sometimes). Is a good preschool program more important than quality care for my child? Why should I have to choose between the two? Is it time to move back to our beloved old day care? Man, I really need to get some sun (and get rid of my farmer's-tan shirt lines) before my sister's wedding in four weeks. Could stand to lose a few pounds, too. But who am I kidding? Only NINE more days of day care for my oldest child! Woo hoo! Six years of paying out the wazoo and dealing with occasional terror teachers, and it's almost over! Yea! Thank goodness for all-day kindergarten. By the time my daughter gets there, it should be standard for everyone. One less year of day care. My goodness. Can you tell day care is consuming my mind today? Get off the darn blog, Corie, and get back to work! Gotta go. What's on your mind today? Well, I finally did it. I called day care today to talk to them about adding Mondays to my work and the kids' day care schedules. I really thought it might be a while before they could work us into the schedule, but I was wrong. By some stroke of luck, both E's and G's rooms had an opening on Mondays. We start picking up that day March 3. Even after debating for so long about whether or not to add a day to my schedule (and therefore take away a day I had with my kids at home) - and ultimately deciding that the extra day was the most practical decision - I am still torn. On the one hand, I know I need the extra time to complete my work. I have been working around 40 hours a week as it is, and having two days at home with the kids, although nice on the surface, is actually more stressful on the work end than it is enjoyable on the family end. Plus, I am finding more and more often that my clients expect me to be available during the workweek, and I am often on tight deadlines for those days, meaning I must work while I have my kids at home anyway. In my ongoing mental battle while trying to make this decision, there were a few things that made me lean toward adding a day. Maybe reviewing them now would help me agree with myself that this is a good decision! I need the time in the evenings to relax and unwind. I have learned that when you don't take time for yourself - when you're not thinking about work or being stressed about deadlines - you wear yourself out, physically and emotionally. It's harder to be in a good mood for my family when I do have time with them, and the evenings run into early mornings as I try to squeeze in every possible hour. Mondays and Fridays are often not the "quality" time with my kids that I had hoped they would be. Again, they often include squeezing in work, but they also fill with sleeping an extra hour, getting all of us ready, runs to the bank, getting an early lunch, keeping the kids from killing each other, getting G to kindergarten, a couple of free hours with E while G's at school, picking up G, getting the kids snacks, putting them down for a nap and then working a couple of hours before my hubby gets home. They're not the quiet, peaceful, playful days I had hoped they would be. I am hopeful that if I make Monday a work day, then I can plan to get up at my regular time on Friday, so that our whole first half of the day isn't spent getting everyone ready. That should hopefully leave us some good, old-fashioned quality time with both kids in the morning and a couple of extra hours with my youngest. There is currently NO wiggle room in my schedule. I panic when our animals come down sick and need to go to the vet or when a kid is sick and can't go to school. I automatically lose a third of my workweek for that one. Making things worse, since I already work every extra minute of the day, evening and weekend, there's no possible way to make up an additional eight hours in the week, so I really put my deadlines and client work in jeopardy. That's not good for any of us! I also don't feel like I can comfortably add anything "extra" into my schedule - lunches with former coworkers or friends, visits to my kids' schools, etc. - which is one of the benefits I had hoped for when I started freelancing. So, I suppose the extra work day is a good thing overall. I am happy that I have enough work to keep me busy during this time, and I am hopeful that gaining back some of my free time will help me feel better overall. I'll just have to really focus on making Fridays special for my kids. I'll have to force myself not to work on those days and give my complete attention to my little ones. Plus, we're still in a good balance overall -- four working days and three non-working days a week. I know that the majority of the working world is not that fortunate, and I am lucky to even have that option. For that I am extremely thankful. Yesterday afternoon, my son stopped me in my tracks. He had brought home a small booklet of drawings he made at school - a very short story about building a snowman that he wrote and illustrated. The top page caught my eye, and I asked him to tell me the story. 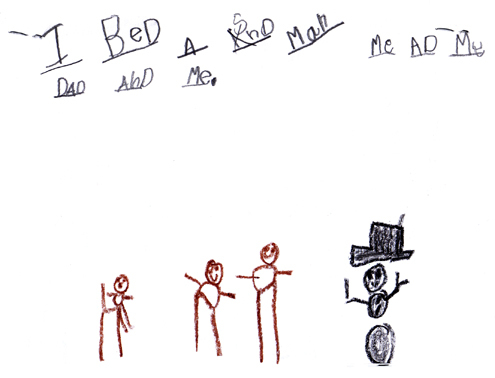 He read me the sentence at the top of the page: "I build a snowman, me and my dad and me." And the snowman was quite creative, even including a hat and buttons! Then I asked him to explain the picture. Starting at the right, he said, "That's the snowman, and that's Daddy, and that's me," and now the kicker ... "and that's you." Yep, that's me. Sitting in my chair watching my family have a good old time building a snowman. My chair. That's where I sit to work at home, out in the open in what used to be our dining room (now my open-air office). He went on to tell me that he drew it small because if he drew it as big as it really is, it would be bigger than the paper. Yes, it is a big chair. I was nowhere to be found in the rest of the book. It didn't take me long to realize what he was saying. Yes, Mommy, you're sitting in your chair, working like always, while Daddy and I have fun. I hear ya, Buddy. Loud and clear. I think every working mother (and stay-at-home mom, for that matter) at some point in her children's early years wonders if she's made the right decision in whether to work (and put my kids in day care) or stay at home. I know the thought has crossed my mind, even though I know in my heart I would be a terrible stay-at-home mom, and I love what I do professionally. I would like to be able to say that I have never second-guessed my decision to make my career a priority, right alongside my role as a mother. I love them both. But of course there are days when I'm stressed with working, and the kids come home from day care filthy and grumpy, and the thought seeps through my mind: Is day care really good for my kids? As part of an assignment for Mooresville Magazine, I just finished an enjoyable interview with three women from Children's Park Child Care Center in Mooresville. They reaffirmed my decision. Yes, I whole-heartedly believe that day care is good for our kids (assuming the day care we choose is a good one!). This day care seems to have it all figured out. Their preschool, all-day private kindergarten and summer programs are remarkable. Their kids go on frequent field trips, learn Spanish in kindergarten, learn how to type in kindergarten, are reading by the end of the first semester of kindergarten, have incredible opportunities for art projects by a talented and very artistic teacher, learn about music through local talents, have gymnastics and dance classes right at the center, get to enjoy visits from firefighters and police officers and dentists, and at least 100 other activities, it seems. We have had generally positive experiences at the day cares we have chosen, too. (Although if I were close to Mooresville, I'd be tempted to switch, just because these women were so incredibly pleasant!) They keep the kids active, take time to teach them so they're not just playing all day, and really have a structure that our kids respond well to. As much as I would like to think I would, I know that if I had my children at home with me every day, I would not be doing all of these things with my own children, despite my best intentions. I know stay-at-home moms that are excellent about taking trips to the Children's Museum, getting their kids outside to play and doing other fun things with them. I also know that they are fortunate to be able to spend so much quality time with their kids, and for that, of course, I am a wee bit envious. But for me, I know that I would be terrible at home every day. It's just me. Plus, I like to work. I need to work, for my own personal sense of satisfaction. But if I this is the case for our family, I am reassured that putting them in day care is not a terrible thing. In fact, I think it's a very good thing. There are a lot of other reasons I think day care is good for kids, but I am not going to take your time to go into them here. I just wanted to share my sense of calm and reassurance after talking with Pat, Bonnie and Judy today. Thank you, ladies, for your time and your love of children. The parents in Mooresville are very lucky to have you! Do I sacrifice the success of my business? When I wandered out on this freelancing adventure back in January, I knew I (and our family) would be making some sacrifices. I knew I'd be sacrificing my regular paycheck, my paid vacations, my paid professional development,the camaraderie of fellow staff members and potentially even our family's financial stability, among other things. What I thought I was gaining for that risk was the increased time with my family, more free time and less work-related stress. But as it turns out, that's not the case at all. In addition to the sacrifices listed above, I am now in a position to have to make a decision about sacrificing these very important quality-time benefits. Right now I work three days a week kid-free (kids are in day care and/or "real" school), and the rest of my work is completed in the evenings, on weekends, during the kids' nap times on Mondays and Fridays, and any free moment I can find. It's stressing me out not to have free time to myself, and worse, to have my kids on Mondays and Fridays begging me to play with them and having to reply, "I'm sorry, sweetie; I really have to work." Last Friday and early today, E was seriously begging. She was pulling on my arm and inviting me to her picnic dinner with plastic food and paper Strawberry Shortcake plates on the living room floor, lying under my barstool while I worked and asking me to color with her, and asking me to sit on the couch and watch a movie. Each time I had to say no. This morning, G was doing the same, wanting me to play Legos with him or play a game with him...just play with him. It completely breaks my heart to not be able to do that. For a good few months now, I have been considering making a change to my work arrangement in order to hopefully gain a little more of my free time back and have more time to devote to my business. But the choice isn't an easy one, and I've been battling this question for long enough. It's time for me to really make a decision. Ugh. From a work perspective, it's clear I need to add a day to my workweek schedule when the kids are in day care and I can have some dedicated time to work at home. If I don't, I will have to start saying no to clients. To do so would be kind of like freelancer suicide in some ways; I'd be destined to turn away these clients for good, and my business is sure to dwindle over time. After all, if they can't count on me to reach their deadlines and do projects on their schedules, they're sure to never call me back. If I want to keep this business going strong - and make this flexible work arrangement last as long as possible - saying no is not an option. But to say yes to everything is its own challenge. It's not really feasible within my current working hours. But from a family perspective, this is a really tough one. I really want more time, not less, with my kids. I want them to know that their mommy put them highest on her list when they were growing up. I want them to know that if you set out for something you really want, even if it's scary or risky, it can work if you try hard enough. But I also want them to have fond memories of our time together, not remember that mommy had to work a lot and couldn't make time to play with them when they wanted to. I really wonder if either of them right now has any clue that I want our time together to be a positive thing. They're kids, not reasoning adults, so they probably feel frustrated and hurt more than comforted and loved. That's not good for anyone, right? So which sacrifice is the right one? Do I sacrifice the success of my business (and potentially the longevity of a working arrangement that allows me flexibility to take care of my family on my own schedule)? Or do I sacrifice a little bit more of my family time, in hopes that, if I do, I'll be able to make the time I have left with them true, quality time (and save a little more of my sanity in the meantime)? Does anyone have any advice? Please click on "Comments" right under this message, and share your thoughts - positive or negative - about gaining another work day. I need some help with this one! Anyone??!! This weekend was fabulous. My mom and my in-laws both last Christmas had the fantastic idea to give my hubby and me kid-free weekend get-aways. This past weekend, we took our second mini-vacation and headed to Brown County. Ah, relaxation. We got to sleep in. Go into crowded shops stroller-free. Wander through the shops without blocking curious little hands from damaging something breakable. Take our time. Never raise our voices. Go on the harder trails at the state park (or at least plan to...Mother Nature had other plans). Talk to each other about stuff other than our kids. It was so nice. Quiet. Peaceful. Relaxing. A reminder of what our former lives once were. But we missed our kiddos. Now I miss my free time. I admit it. Kid time is not easy time, fun time, relaxing time. I had the kids home with me today (except for a few hours when my mom rescued me so I could work a while). The day was exhausting. The kids have had a few days of being shuffled around from Nana to Grandma and back again. They're feeling the effects, and so am I. Add to that the fact that I had to cut their naps short to get them up and head to a hair appointment...and then locked us out...again...in the rain...again...and it wasn't a good day. Now I'm up late...again...working, and I'm REALLY missing my free time. Before freelancing, I worked like crazy, but my time at home was time just for my family and for me. I could leave the work at the office, and whatever didn't get done there, didn't get done until the next day. Once the kids were in bed, I had three hours every night to do whatever I needed or wanted. Now, my office is constantly within eyesight. My working hours are numbered (I'm only kid-free for three days), and my workload is growing. This adds up to very limited free time. That's why this weekend was such a joy. Free time is a true blessing. Take my advice...enjoy it when you've got it.